Everyone’s abuzz about the BBC’s recent piece on an ‘uncontacted tribe’ living in the Brazilian rainforest. And by everyone, I especially mean those of us who recently researched and wrote Lonely Planet’s Brazil 8 book. One of the great things about working with a team of writers and editors on a particular title is that we share a passion for a place. Current events in that place are automatically of collective interest. If you haven’t seen this clip yet, take a minute. The footage is stunning. While I was watching this, I was remembering a stand-out moment from my research trip to Brazil last year. 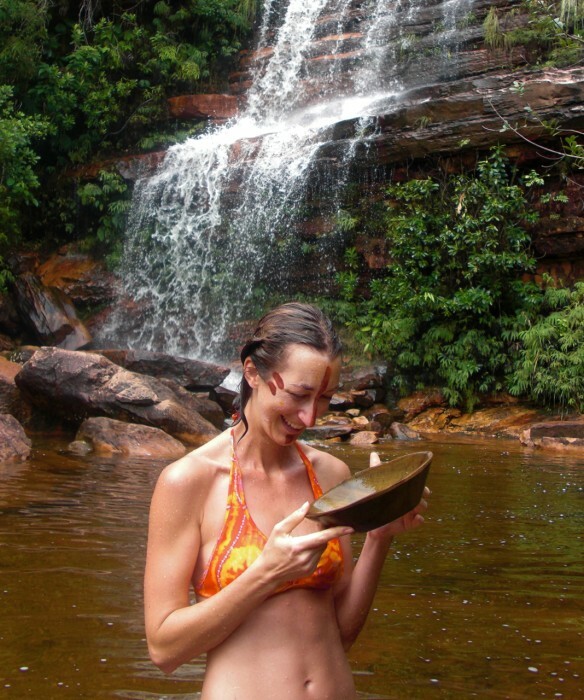 I was covering Bahia, Sergipe and Alagoas on the northeast coast; one of the only inland destinations on my list was Chapada Diamantina National Park in Bahia. My sister Molly was with me for that leg of the trip. One morning we hired a guide to take us hiking high up into the clay-colored cliffs, through rock caves, past crashing waterfalls… the foliage was so lush, the air was so warm. Molly happens to be an art conservator, and immediately she could see that the bowl wasn’t just a throwaway left by some careless campers. The guide confirmed that the bowl was, indeed, a ceremonial piece almost certainly crafted by an indigenous group that used to live on the other side of the national park. Maybe it’s better that the bowl stays in Brazil, anyway. But the moment stands as our own halfway-mysterious brush with an unidentified indigenous group. Coming from a nation where our native populations have been almost entirely wiped out or sequestered in reservations, it’s refreshing to know that such tribes do exist – somewhere on our planet – ‘uncontacted’ for the time being. *** A note on Molly’s tribal facepaint. Funny story here. The guide was showing us some of the natural pigments found in the park’s rocks, mud and clay, and he used some of it to paint a design on Molly’s face. This was really cool. But then she couldn’t get the paint off later. She was scrubbing her face at the hotel sink, the clay pigment refusing to budge. I was no help whatsoever because I was rolling around on the floor with laughter. I thought it would be sort of amazing if she had to board a plane back to the US with her tribal facepaint. But somehow she got the natural dye off her skin – art conservators know chemistry. Turns out it’s a handy skill in a compromising situation. March 1, 2011 | Filed under Faraway places.